Thanks to those who entered the competition. It was interesting to see the different interpretations of what was required. Push the boat out by Perspicador. Certainly plenty of flowers, a boat load in fact but the brief did say a vase of flowers. I think the metal post detracts too. Flowers in ice by JAK. I did like this one but cou;dn't tell if it was flowers frozen in a solid block of ice then carved. A good effort. Tulips in a vase by noelm. This fitted the brief and I did like the processing in this one. More like an oil painting. The remains of the bouquet by davidwozhere. I liked the humour of this one, using a jam jar as a vase until a vase could be found.. I just wish the whole jar had been shown. Gift bouquet by smudge. 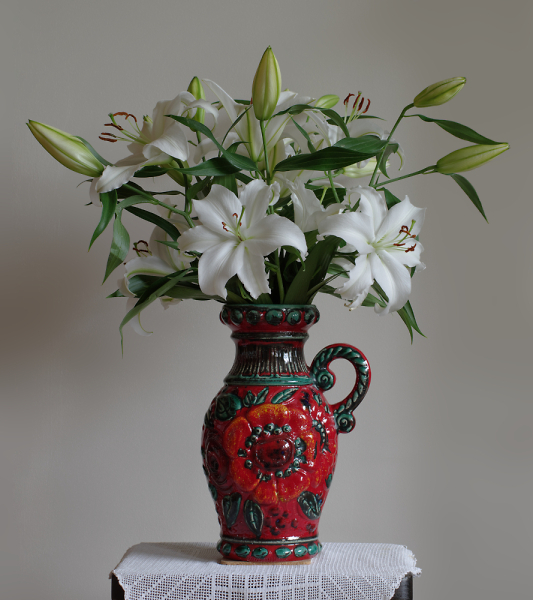 Fills the brief and was a contender for top spot, showing the flowers and a nice complete vase. Sunflowers by Nigelk. I think it almost fills the brief but the base of the vase is missing and that hotspot is a distraction. Daffodills by GlynM. Another image that fills the brief but again the bottom of the vase has been cropped off. Vase of flowers by Noelcmn. Once more another image with only a fraction of the vase showing. White Lillies by Abe_Normal. I liked this and it has all the elements I was hoping for. The complete vase the colour of which contrasting nicely with the flowers. Thar's a beautiful shot, wonderfully crisp. Congrats Abe_Normal, worthy winner! And extended to Noelm and Smudge. Thanks to our Judge for the challenge and C&C's. Well done to Abe_Normal, Noelm and Smudge for your podium places. Thanks too to Stan for the challenge and judging. As to whether it was flowers frozen in a solid block of ice then carved, yes it would have been. I would have thought the wheelbarrow would have been carved from one block and the flowers frozen into another judging by the fact the stalks are cut off evenly and don't seem to extend into the barrow. The last real vase of flowers indoors here was when I bought my last car! Thanks for the prompt adjudication and giving me the nod. Well done to podium finishers noelm and smudge, and a thank you to the other entrants for their colourful efforts. Thanks to tyronet2000 for the 2nd spot and congratulations to Abe_Normal for his winning image and to smudge for his 3rd place. Thanks also for a colourfull subject and for his concise comments.